Bear Two- | It's not a slow car, it's a fast house! It was 8:00pm and we were hanging out in the van watching a movie. The doors and windows were closed to the keep out the cold, Yukon night air. It was light outside, as it doesn’t get dark until about midnight, so the curtains were drawn. For some unknown reason Geneva felt compelled to sit up and pull the curtain aside. She said, “Mike you better come over here”, so I paused the movie to take a look outside with her. And right there, just a few feet from our faces was a Black Bear. It had just knocked 50 lbs. 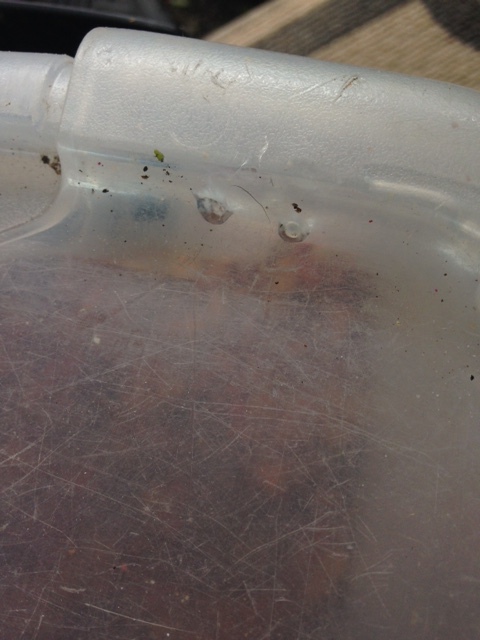 of water off the top of the plastic dog food storage container. As we watched through the glass it began dragging the plastic box down the dirt road. By the time Geneva got the bear spray and we climbed out of the van, the bear was about twenty meters away. We began yelling but the bear continued trying to open the plastic box. I started throwing rocks at the bear to get him to drop the dog food box. Now I’m not a baseball pitcher nor do I win any gifts at the carnival but I hit the bear twice and the box once. Of course my hit to the box blew a huge hole in the side, which the bear appreciated later. After my second hit the bear decided to take a walk further down the road and into the bushes. He left the food box cracked opened and sitting in the road. Geneva covered for me with the bear spray ready, as I ran up and grabbed the box, spilling out some dog food. We ran back to the van and put ourselves (and the broken dog food box) inside the van. We have been told numerous times, at every campground and picnic area, to be “bear aware” by securing all food items and trash inside a bear box or vehicle. Fortunately our bear encounters have been few thus far. The warnings almost seemed like a tourism trick so that folks felt like they were on an adventure. NOT. They are out there. We were not in a campground, as with the last bear encounter. This was probably not a habituated bear, accustomed to raiding ice chests and picnic tables. We were boondocking at a wilderness site that we found down a dirt road. We were lakefront, off a main highway, 20 minutes from Carcross, Yukon Territory in the backyard of a Black Bear who smelled dinner. We were in his ‘hood. And he wanted a snack. So to continue; we restarted the movie and paused it each time we heard the bear return to the van. Once to eat the food trail that spilled forth from the box when I hit it with the rock. Twice to check out our big jug of water. Lastly he did a few once-a-rounds of the van, looking for anything that we might have missed. Of course, the dogs were sleeping through all of this action and for some reason did not even budge until the last go-round. At that time Mango stood up on the window and saw the bear right outside. She started yelping at the bear through the glass. The bear heard her and ran away (first time it moved quickly in two hours). I wish I knew what she said, because that was more effective than anything we did, to make this bear go away. We made another interesting discovery the next morning. I went for a short walk with the dogs, carrying the bear spray with me. When I returned I inadvertently dropped the can of bear spray on the ground. It must have hit right on the handle. It delivered a quick pulse of spray in the direction of the van. I yelled to Geneva to let me know if she smelled anything because I couldn’t smell or see that anything had come out. She quickly jumped out of the van retching and coughing. Her eyes welled up with tears and she was doubled over for a few minutes. When she was able to speak she said that her throat felt like it had gravel in it and her eyes were on fire. She did recover enough to beat the crap out of me, which I deserved! As much as I was horrified by the results of the accident, I was equally amazed by the effectiveness of the bear spray. We learned another lesson. This spray could be used on attackers and individuals who were not well-wishers. Using “The Bare Campsite Program” brochure as a gentle reminder. We do now keep everything inside the van at night. We have purchased a second can of bear spray. I carry one every time I hike around with the dogs. The second stays at the van for Geneva to use if she needs to. 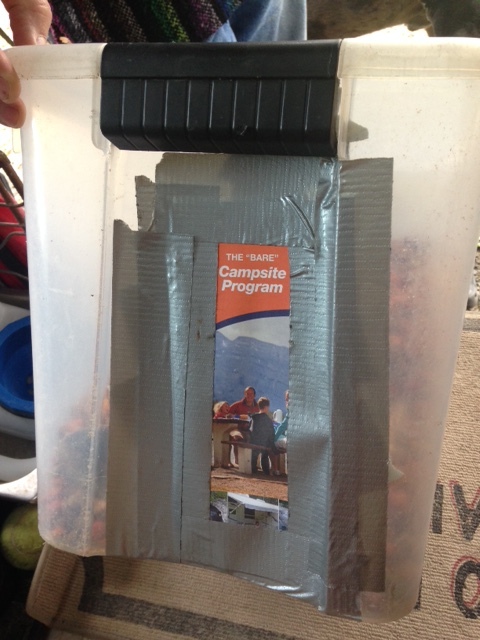 We patched up the dog food box with duct tape and the “bear aware” brochure from the Park Service. Just a little reminder of bear two on our trip. More lessons learned while on the road. Claw holes from bear dragging box up the road. Last year with our Hot Springs Tour, we had a bear take off with our cereal and a fellow campers cooler. There 3 dogs in 4 vans and not one of them woke up. All went well after that. Oh, and you were right not to stop to take pictures – that little pause in time could be enough time for the bear to rush you. Plus, some bears are infuriated by camera flashes. Geneva and Mike, you are incredibly lucky! Black bears can easily punch out car windows, rip out rubber-mount windshields (like our beloved Vanagons) and do a lot of other vehicular damage if they are really hungry and smell the food inside a vehicle. Even where I am in southern Canada, when camping in bear country away from campgrounds I want all food in a bear barrel suspended up a tree, not on the ground or in my vehicle. And if black bears are bad, grizzlies are worse. Keep your bear spray always to hand, and enjoy the rest of the trip! Nobody teaches wildlife our ‘rules for civilized behavior”, and it is amazing how quickly they learn to take advantage of situations. Funny how every American thinks Australia is full of things ready to kill us but we rarely encounter crocs or sharks. Spiders are easy to squash and snakes are generally very shy creatures. But bears, bobcats….., no thank you. Very Interesting event. Glad that you two are okay. I agree with Lynne, where are the pics? Boy, you two are lucky so far, please be safe !! !